Earlier this month in São Paulo Brazil, over 100 countries with representation from civil society, governments, clinicians and public health came together for the 2nd World Hepatitis Summit to galvanise and encourage global efforts to eliminate viral hepatitis as a significant public health threat by 2030. A staggering 325 million people globally are living with viral hepatitis, with 1.34 million deaths in 2015 alone. In England, around 180,000 people are infected with hepatitis B and 160,000 with hepatitis C.
Elimination should no longer be a pipe dream in England as over the past decades we have implemented key policies and interventions: safe injection and infection control practices, safe blood supplies, harm reduction strategies, universal antenatal screening for hepatitis B, and selective immunisation for hepatitis B targeting infants born to infected mothers and other risk groups. The success of harm reduction strategies and targeted vaccination in people who inject drugs is reflected by data that suggests that only around one in 200 people who have injected drugs are currently living with hepatitis B infection. Previous studies suggest over half of people with hepatitis C infection in England acquired their infection via past drug use and other routes, like blood transfusion before September 1991. In the past couple of years, new highly effective treatments for hepatitis C have been rolled out in the NHS – all oral treatments that can cure most people, have fewer side effects and require a shorter treatment course. The target for NHS England is to treat 15,000 patients a year by 2020/21. If this can be achieved and maintained, modelling suggests this would lead to an 80% fall in severe hepatitis C-related liver disease by 2030. This year, we also introduced hepatitis B infant immunisation into the routine childhood schedule, where we expect third dose vaccine coverage to exceed the 90% target for 2030, further strengthening our commitment towards elimination goals. However in England, we need to do more to achieve a level of awareness and engagement among professionals and affected populations that prompts those at risk to come forward for testing, act upon a diagnosis and seek life-saving treatments for hepatitis B and C.
As there are often no specific symptoms for hepatitis B and C, people may not be aware they are infected until they suffer the severe consequences of liver damage. We therefore welcome this week's EU testing week for hepatitis as an opportunity to highlight that testing – the first step to getting treated – benefits the individual, their families and the communities in which they live. Raising awareness among GPs is important, so they can recognise and ask about risks for infection. Free online training resources and an e-learning module are already available from the Royal College of General Practitioners (RCGP) to help them do this. Most of the burden of hepatitis B in England is in people who acquired infection overseas in endemic countries prior to migrating to the UK. NICE guidance supports targeted testing of people born in countries where the prevalence is greater than 2%. PHE’s migrant health guide can support practitioners in identifying who should be tested. 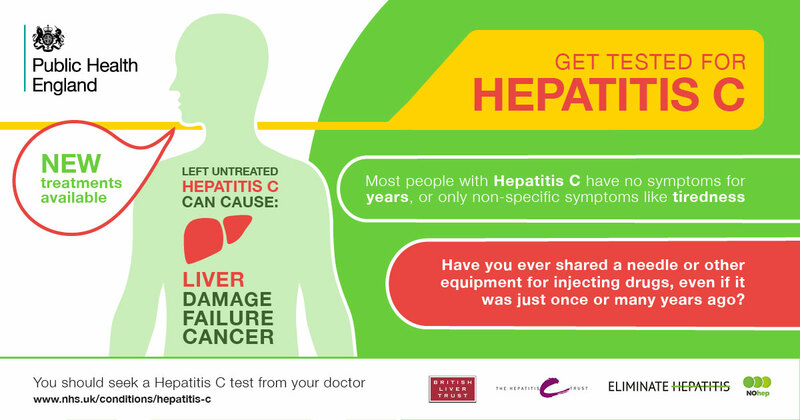 Helping people to realise their own need for testing is also crucial, which is why we have worked with British Liver Trust, The Hepatitis C Trust and World Hepatitis Alliance to promote testing through a quick online quiz (for hepatitis C), and posters, videos and social media banners for hepatitis B and C. These resources help people identify whether they may have been exposed to hepatitis B or C virus and would benefit from a test. Please download our posters and display them in your practice. Please share the banners and video links on your social media or display systems and help encourage as many people at risk to get tested and get treated.